Celebrating 25 Years in Devonport! 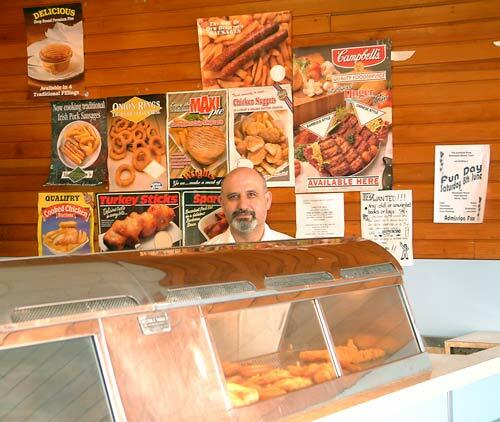 On Thursday 18th July Michael Michaelides of Jaws will be celebrating 25 years of being in the fish & chip business at Cumberland Street in Devonport. If you are passing on that day I’m sure you will see some sort of flag flying in their window. 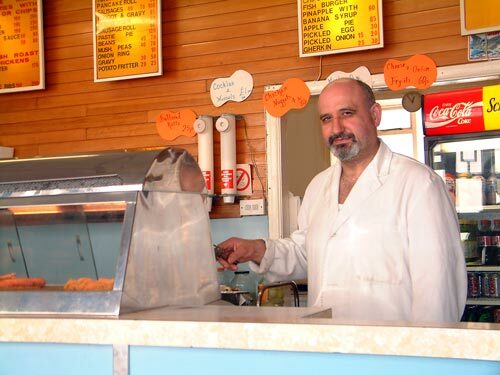 Originally from Cyprus Michael first came to England 28 years ago, and within three years had moved to Devonport and established what was to become a thriving local business. 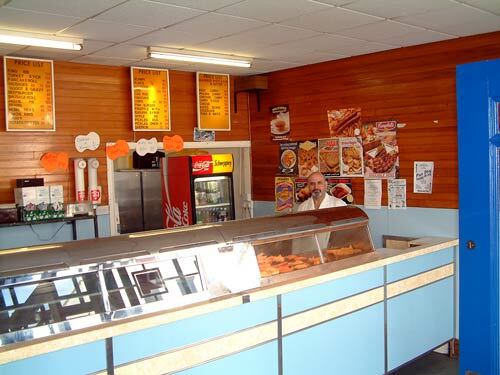 When he first moved in, the shop was called John Hooper Fish & Chips, after the previous owner, but around that time the movie ‘Jaws’ was making a hit in the cinemas – Michael thought the name suited perfectly his fish shop – and it’s been called that ever since. His first impression, 25 years ago, was that Devonport was... “like a village where everyone gets to know one another". He continued,"Maybe it’s not quite like that nowadays but it was years ago – people were so friendly and everyone in this part of town communicating with each other, including to me as a newcomer. I’ve made lots of friends around here. I know many people and understand the community and the changes that are happening." About ten years ago, Michael and Dave (then the chemist at nearby Stoltons) wrote to Plymouth City Council about bringing improvements to the area. Subsequently various Action Groups developed in pockets within Devonport and, by 2001 the New Deal for Communities (NDC) initiative arrived in Devonport ***. Michael recalled that Robert Plumb of Plymouth City Council later remarked to him, “you were among the early ones in getting things moving” so Michael is proud of his community contributions. When the New Deal for Communities arrived in Devonport Michael supported its development and attended meetings, but for the moment however, business schedules prevent further attendances. He said, “if NDC get it right, then Devonport will be improved, it will be good for all concerned, for residents and for businesses - but there needs to be a good healthy mix, of different types of business, of residents old and new – a good mix”. After ten years of successful trading in Devonport Michael was able to buy number two George Street, which was then operating as a bakery. 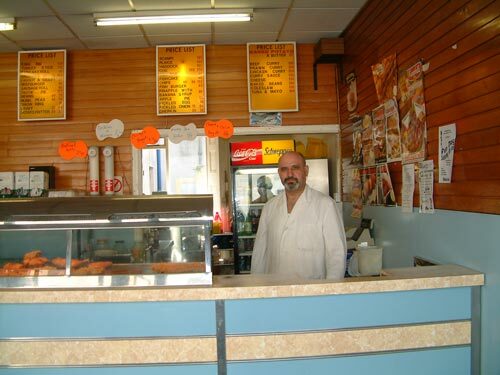 In 1994 he modernised this property, reopened as a pizza parlour and renamed the shop Mystic Pizza. Yes, that’s right, after the movie of the same name. 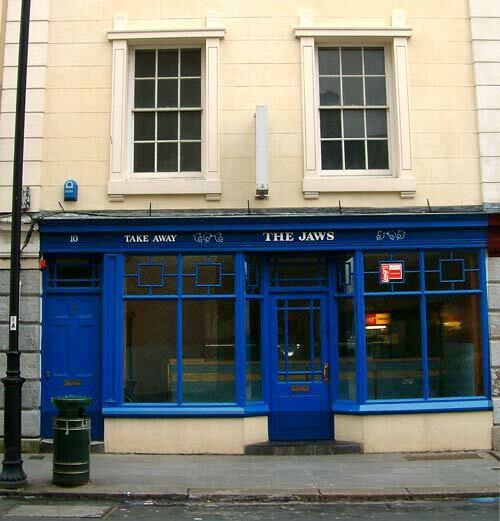 Jaws Fish & Chips shop in Cumberland Street. *** In order to deliver the NDC program, an arbitrary line was drawn around the map of Devonport, cutting off some areas and streets. For example, the programme did not officially extend to Morice Town, which has always been a part of Devonport.